The Aadi Mahotsav, a celebration of the spirit of Tribal Culture, Craft, Cuisine and Commerce, came to a glittering conclusion at Dilli Haat, New Delhi, on the evening of 30th November, 2017. 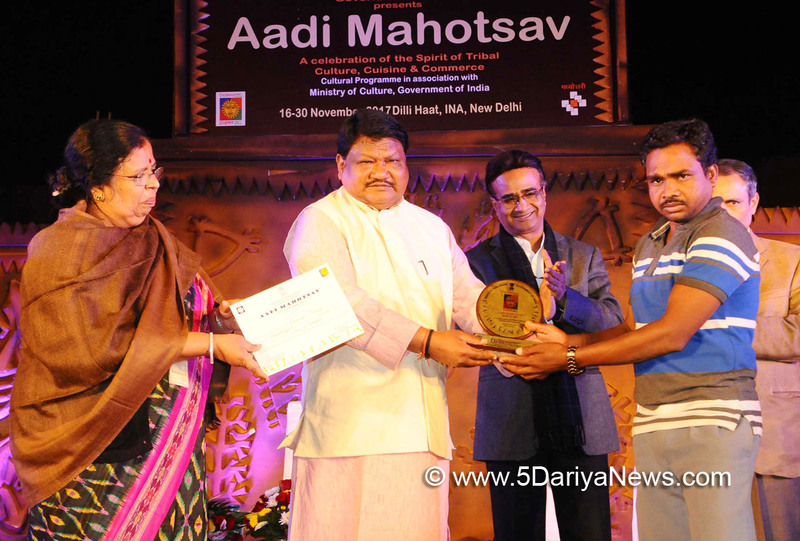 Union Minister of Tribal Affairs Shri Jual Oram was the Chief Guest at the closing ceremony of Aadi Mahotsav. Secretary, Ministry of Tribal Affairs Ms. Leena Nair was specially present to grace the occasion. Managing Director, TRIFED Shri Pravir Krishna and other senior officials were also present on the occasion.Speaking on the occasion, Shri Jual Oram expressed his happiness at the successful conduct of the Mahotsav. The Minister stated that through its 15 days of engagement with lacs of Delhi residents, the Mahotsav had shown to them the exquisite craftsmanship of tribal artisans. This event explored new horizons for tribals. The focus is on how tribals can get the good prices for their products. New Franchise and tie ups with e- commerce portals like Snapdeal and Amazon can boost their business. More outlay for TRIFED seems possible through the encouragement of public in this event. Minimum Support Price for tribal products is on the agenda. The Minister congratulated the Ministry and TRIFED for the wonderful arrangements made, which had won the hearts of all the participating Tribals and Delhites alike. The Secretary, Tribal Affairs, Ms. Leena Nair in her welcome speech thanked the Minister for his leadership and direction for organising the Aadi Mahotsav which gave a platform for almost 800 tribal artisans to showcase and sell their products in the big commercial world of Delhi. She stated that transactions of over Rs. 4.00 crores had been done by the tribals. She thanked all the Tribal Artisans and participants who had participated in the Mahotsav and hoped that they will continue to progress and benefit from the Government schemes. TRIFED would continue to showcase and promote their art before the Country and the World.Union Minister for Tribal Affairs, Shri Jual Oram launched TAM Squash- a non alcoholic drink developed by TRIFED & IIT-Delhi. The non alcoholic drink is made up of Tamarind, Mahua & Aawla. It is refreshing and good for overall health.Later, Shri Jual Oram gave away the awards to the best performing groups and Regions in various categories like Textiles, painting, pottery, cane and bamboo, jewellery, metal, organic and natural food, popular cuisines and TRIFED regional offices. Tribal artisans, for the first time in the history of Dilli Haat, engaged in digital transactions for which card readers were provided to all. The Minister commended TRIFED for introducing digital transactions and almost 30% of the transactions were through this route. All the Tribal Artisans were trained for using card readers by a special team from SBI.TRIFED has also entered into e-commerce transactions and TRIFED in future could sell the products through Amazon, Snapdeal, Flipkart and GEM (a Government of India portal of e-commerce) for which preparations are on. It is expected that sales on these portals should commence by January, 2018.A special scheme to provide loans from National Scheduled Tribes Finance and Development Corporation (NSTFDC) was also introduced during the Aadi Mahotsav. Each of the tribal entrepreneurs was interviewed with regard to their requirement of loan for expansion of their business. 106 cases are being considered and examined for providing loans at a special rate of 6% to tribal men and 4% for tribal women.The Tribal Artisans logged a sale of more than Rs.1.60 Crores during the fortnight, which is a record for this event by a long distance. TRIFED purchased goods worth Rs.2.50 crores from the Artisans for sale through its showrooms. The total sale of tribal artisans during the Mahotsav was Rs. 4.10 Crores. This is a very heartening feature for the tribal artisans who are extremely happy and have promised to participate in all future Mahotsavs with the same zeal. The success of the Mahotsav has encouraged M/o Tribal Affairs to organise another 15 such Mahotsavs in other State capitals of the Country in the coming months. TRIFED has invited Tribal artisans to display and sell their craft and cuisine at all these places. The next Mahotsav will begin in Jaipur from 1st December, 2017 and Bhopal from 16th December, 2017 followed by other States, finally concluding by middle of March, 2017.Stage programs of tribal dances and folk songs conducted daily were a great attraction every evening. 85 Tribal Chefs from 25 states showcased tribal delicacies like Banjara Biriyani from Telangana, Khodiya Roti and Chicken from Orissa and delightful vegetarian and Non-vegetarian preparations from North East, Jharkhand, Maharashtra, Gujarat and other States. The people of Delhi greatly relished them. Keeping in view the great demand for these preparations, it has been decided to continue these stalls at Tribes India, Mahadev Road.The Mahotsav organised at Dilli Haat, INA; Dilli Haat, Janakpuri, Central Park Rajiv Chowk, Baba Kharak Singh Marg, New Delhi had attracted more than 3 lakh people who enjoyed shopping, dining and the tribal cultural 2 programmes. North Central Zone Cultural Centre (NCZCC) brought almost 450 tribal artists from 25 States of the Country to present exquisite tribal dances, display of Martial arts and folk music. The Vice President, Shri M. Venkaiah Naidu inaugurated ‘Aadi Mahotsav’ - a fortnight long Tribal Festival with the theme of ‘A Celebration of the Spirit of Tribal Culture, Cuisine and Commerce on 16 Nov 2017 at New Delhi. The Union Minister of State for Home, Shri Kiren Rijiju, Minister of State for Tribal Affairs Shri Sudarshan Bhagat; the Vice Chairperson, National Commission for Scheduled Tribes, Smt. Ansuiya Uikey also graced the Aadi Mahotsav on other days.Managing Director, TRIFED Shri Pravir Krishna thanked the Vice President of India, Minister for Tribal Affairs, Ministers of State for Tribal Affairs, The Vice Chairperson, National Commission of Scheduled Tribes, Secretary, Ministry of Tribal Affairs for their support, leadership and guidance in conducting the Aadi Mahotsav, which had generated record sales during the Mahotsav. He also thanked officials of the Ministry of Culture, NCZCC, NDMC, Safdarjung Hospital, DAVP for their support and cooperation for the successful conduct of the Mahotsav. He also thanked the Team TRIFED for their very hard work which had made this event possible.The Mahotsav concluded with glittering cultural programme comprising of tribal dances and folk music with a promise made to all the participants to meet again at the same venue, same time next year and the years to come.